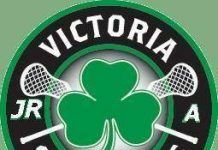 The Junior Tier 1 Shamrocks won their home opener in convincing fashion, coming away with a 17-4 victory over the visiting Burnaby Lakers at the Q Centre Saturday afternoon. The Rocks opened up a 7-0 first period lead and added 5 more goals in each of the second and third periods. Leading the way offensively was Liam Phillips with 5 goals, 3 in the opening 20 minutes. Jonathan Boyd added 4 goals and a helper, Isaac Swan chipped in a hat trick and 1 assist while Nic Coleman and Casey Wilson added 6 and 4 assists respectively. Ryan Atkinson picked up the win in goal. The Tier 1 Shamrocks return to the Q Centre next Saturday, May 5 to host the Coquitlam Adanacs at 1:00 pm. That will be followed by the Jr. ‘A’ Shamrocks’ first home game at 4:00 pm, also against the Adanacs. 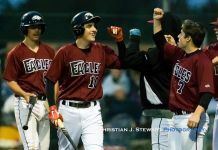 The Jr. ‘A’ team opens on the road tomorrow against the Port Coquitlam Saints.